All peptides are amides, but not all amides are peptides. The reason this is significant is that I often hear comments that suggest that amides are to be avoided in drug design. I think those who say this really mean peptide bonds, and not amides in general. There is absolutely nothing wrong with amides that are very commonly used tools in medicinal chemistry. However, when the said amide is seen in an environment that contains flanking amino acid side chains, all sorts of red flags can be raised. The reason is that peptidases are uniquely suited to chop peptides. Peptidases recognize certain amino acid sequences and go after amide linkages in those particular contexts with a vengeance. This is the main reason why peptides are poorly bioavailable. Below you can see a view I made that corresponds to a peptide-based inhibitor bound to its cognate endopeptidase (pdb code 1a94). This crystal structure was obtained by replacing the scissile amide bond by its aminomethylene isostere. Without this trick, we would not have a chance to see the relevant pose because the substrate would have been cleaved in a hurry. But with the aminomethylene group in place of the key amide, one can observe how the rest of the molecule binds. 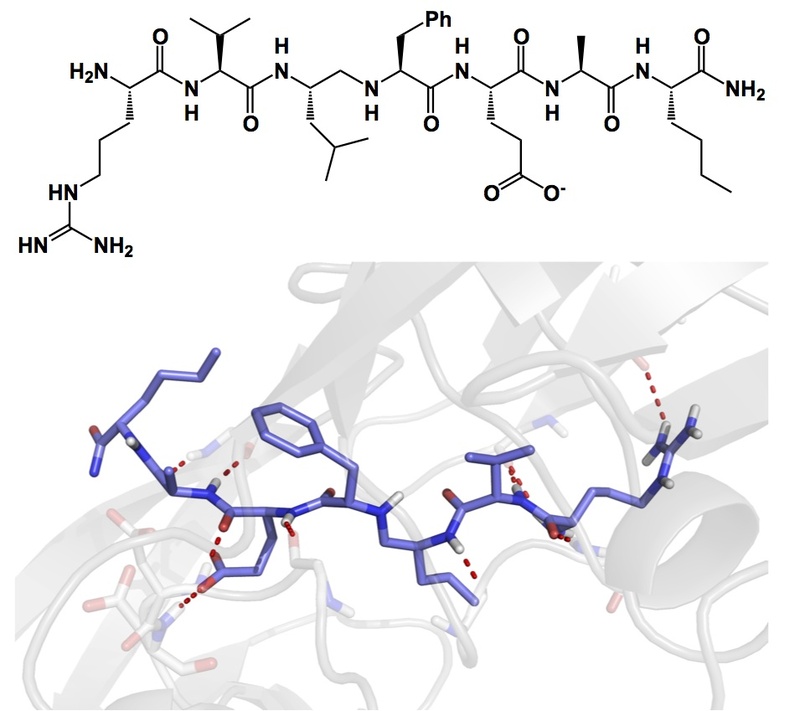 You cannot expect a peptidase to easily cleave a non-peptide amide. Thus, amides and peptides are to be differentiated. It is too bad that we do not have a simple name for amides that are not peptides. Maybe we should come up with one. This entry was posted in Uncategorized and tagged amides, peptide bonds, peptides by ayudin2013. Bookmark the permalink.